From Left: DAA Recipient Dr. Douglas Neckers, a 1960 Hope graduate from Perrysburg, Ohio; Alumni Association President Thomas Kyros '89 Grand Rapids, MI; and DAA Recipients Lois Veldman, a 1956 Hope graduate from Okemos. and Dr. Jerold Veldman, a 1955 Hope graduate from Okemos. The Hope College Alumni Association honored three alumni during the annual Alumni Banquet on Saturday, April 25. The association presented Distinguished Alumni Awards to Dr. Douglas Neckers, a 1960 Hope graduate from Perrysburg, Ohio; Dr. Jerold Veldman, a 1955 Hope graduate from Okemos; and Lois Veldman, a 1956 Hope graduate from Okemos. The annual Distinguished Alumni Awards are presented by the Alumni Association Board of Directors in recognition of the awardees’ contributions across decades or even across a career to society and service to Hope. The award, inaugurated in 1970 and presented during the college’s Alumni Banquet, is the highest honor that alumni can receive from the college’s Alumni Association. Douglas Neckers is a photochemical scientist who has had a 55-year career in science. He is retired as the McMaster Distinguished Research Professor emeritus from Bowling Green State University, where he established the Center for Photochemical Sciences, and is currently chief executive officer of Spectra Group Inc. Ltd., a photochemical sciences company that he founded. After completing his doctorate in organic chemistry at the University of Kansas, Neckers returned to Hope as a member of the faculty from 1964 to 1971, leading an active research program involving students in addition to teaching. He subsequently taught and conducted research at the University of New Mexico until joining the chemistry faculty at Bowling Green State University as chair of the Department of Chemistry in 1973. He was at Bowling Green for the next 36 years. Under his leadership, the Center for Photochemical Sciences, which he founded in 1985 and directed until retiring in 2009, became the only Ph.D. program in the photochemical sciences in the United States. The center has graduated more than 200 doctoral alumni who are employed throughout the world in industry and the academy. Across his tenure, he directly mentored 39 Ph.D. student graduates from 37 foreign countries, approximately 50 post-doctoral fellows and numerous undergraduates. His research interests are in photochemical polymerization, additive photo assembly and three-dimensional printing. During 45 years in the academy, he published more than 400 papers and 11 books, edited three series and invented more than 90 patents. Neckers founded Spectra Group Inc. Ltd. in 1990 to develop the then-new technology of stereolithography in medical imaging. His labs were the first in the world to print MRI and CT data as 3D models using what is now called additive 3d printing. Other distinctive applications include having assembled three “near authentic” models of centuries-old mummies for the Toledo Museum of Art. He became Spectra’s CEO when he retired from Bowling Green. Neckers has won numerous awards, including several from the Inter-American Photochemical Society and Bowling Green State University. He was a Fellow of the Alfred P. Sloan Foundation, received a National Science Foundation Creativity Award in 1994, was Morley Medalist of the Cleveland Section of the American Chemical Society, is an Honorary UNESCO Professor at Mendeleyev University in Moscow and a Fellow of the American Association for the Advancement of Science. His work was supported at Bowling Green by the NSF, DARPA, Office of Naval Research, Petroleum Research Fund and the State of Ohio, Office of Economic Development. His community involvement includes serving on the Executive Committee of the Board of Directors of the Toledo Symphony Orchestra and as the founder of St. Tim’s Discovers, a music series at his church, St. Timothy’s Episcopal Church, dedicated to discovering new and unknown musical talent for the Toledo community. He is also Henry T. King Fellow, and chair-elect of the Board of Directors, at the Robert H. Jackson Center in Jamestown, New York, the only center in the United States dedicated to the legacy of a Supreme Court justice. Neckers, who majored in chemistry, attended Hope as a third-generation student, the son of M. Carlyle Neckers (’35) and Doris (Van Lente ’36) Neckers and grandson of Albert Neckers Jr., who graduated from the Hope Academy high school in 1891. He and his wife, Sue (Evans), a Hope classmate who majored in history, both came to Hope as transfer students, from Bucknell and Rochester respectively. They have been married for nearly 55 years, their entire adult lives, and have two children, Pamela and Andrew. Jerold and Lois Veldman have spent their lives in service to others, including in the United States and India, as educators, medical professionals specialized in pediatrics and volunteers in the community and beyond. While at Hope, Jerry majored in biology and chemistry, and Lois majored in English and education. During the first several years after graduation, Jerry completed medical school at the University of Michigan as well as his internship, residency in pediatrics and service in the U.S. Air Force, while Lois served as an elementary teacher. In 1966, they moved to India as missionaries with the United Presbyterian Church USA, stationed first near Mumbai for a year of language study and then in Miraj, Maharashtra, where Jerry took a position on the pediatrics staff of Miraj Medical Centre Hospital, a teaching hospital. Through 1971, Jerry and a colleague developed the hospital’s pediatric department, teaching medical students and house staff in clinical pediatrics, with Jerry additionally serving as acting director of the Richardson Leprosy Hospital for two years. During the same period, Lois taught missionary and hospital staff children, including the couple’s three young children; helped to start a library; and volunteered with the leprosy hospital. When they returned to the U.S., Jerry practiced pediatrics for 12 years before joining the staff of the Coldwater Regional Center for Developmental Disabilities (later the Coldwater Regional Mental Health Center), serving as medical director from 1986 to 1992. He subsequently joined the staff of Sparrow Hospital in Lansing, Michigan, where he established the Newborn Teaching Service for Michigan State University, until retiring in 1998. Throughout his career after returning from India, he held a faculty position as a clinical professor in pediatrics at the Michigan State University College of Human Medicine. He received multiple service and teaching awards from Michigan State, including the 1994 Distinguished Community Volunteer Faculty Award and the 1997 William B. Weill Jr. 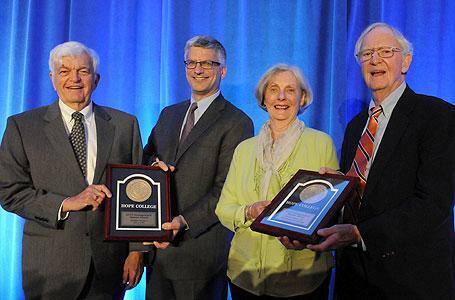 M.D., FAAP Endowed Distinguished Pediatric Faculty Award. In addition, the university renamed “The Dr. Jerold Veldman Clinical Faculty Teaching Award” in his honor. Recognition by other organizations has included the Friend of AMI Award presented in 1992 by the Alliance for the Mentally Ill, and the 1996 Whitehill-Robbins Miracle Makers Award from the Children’s Miracle Network. Lois upon returning to the U.S. was busy with the couple’s children in addition to her career and extensive volunteer service. She served as a substitute teacher in East Lansing for three years; returned to school and received her R.N. degree from Lansing Community College in 1981, after which she worked in a pediatric practice; and was a tutor for the learning disabled through the Michigan Dyslexia Institute from 1986 until retiring in 1992. Both Jerry and Lois have been active volunteers throughout their lives, during their careers as well as now in retirement. Among other activities, Jerry is a trustee with the Medical Benevolence Foundation, which is the medical mission arm of the Presbyterian Church USA; is a member of the board of the Faculte des Sciences Infirmiers de l’ Universite d’ Haiti (FSIL), a nursing school he helped establish in 2004; and serves on the board of the Miraj Medical Centre where the current hope is to start the third Christian Medical College in India. The Christian Medical College at Vellore started by Dr. Ida S. Scudder of the Reformed Church in America is one of the others. Lois’s extensive community involvement includes having served as a program chair and member of the Community Volunteers International Program of Michigan State University; as a volunteer, and recruiter and trainer of volunteers, for the Sparrow Hospital Emergency Room; as a program chair and member of the Friends of Branch County Library; and as president and board member of Woodhill Condominiums. She has also been actively involved in the church, including as an elder at Peoples Church in East Lansing, First Presbyterian Church of Coldwater and Presbyterian Church of Okemos. Lois served on the Hope College Alumni Association Board of Directors from 2006 to 2012, and is also a past Class Representative for Hope. The couple has been involved in helping organize a variety of Hope events, and has established a faculty development fund at the college. Jerry was a second-generation student at Hope, the son of Jerry Arthur Veldman (’25) and Adelaide (Borgman ’25) Veldman. Jerry and Lois have three children: Timothy Veldman, Jon Veldman (’82) and Sarah Mickelson (’85). Hope College’s 150th Commencement, celebrating the graduating Class of 2015, will be held on Sunday, May 3, at 3 p.m. at Ray and Sue Smith Stadium. A total of three long-time members of the Hope College faculty are retiring at the end of the 2014-15 school year.